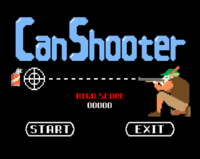 Can Shooter is one of the unlockable minigames in WarioWare: Smooth Moves. It is an expanded version of Ashley's microgame Shoot the Breeze. As such, Can Shooter is unlocked upon completion of her stage. 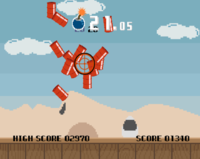 In this minigame, players use the Wii Remote to point at and shoot at cans, firecrackers, barrels, spinning discs and missiles. The minigame is under a time limit, and once the timer reaches zero, the game is lost. Time can be gained by shooting at cans embedded with hearts. The minigame's pace starts out slow, but increasingly fasten the longer the player survives. The timer also speeds up with the pace. Targets constantly appear and disappear and even fly around. Shooting a target dead-center gives more point. Missiles and thrown firecrackers are occasionally fired, and must be destroyed before they hit the screen. Upgrades also appear in the minigame. One upgrade slows down the pace considerably for a short amount of time, and another turns the pointer large and square instead of a usual small circle pointer. The minigame is over once either the timer reaches zero or a projectile hits the screen. This page was last edited on April 5, 2018, at 12:25.